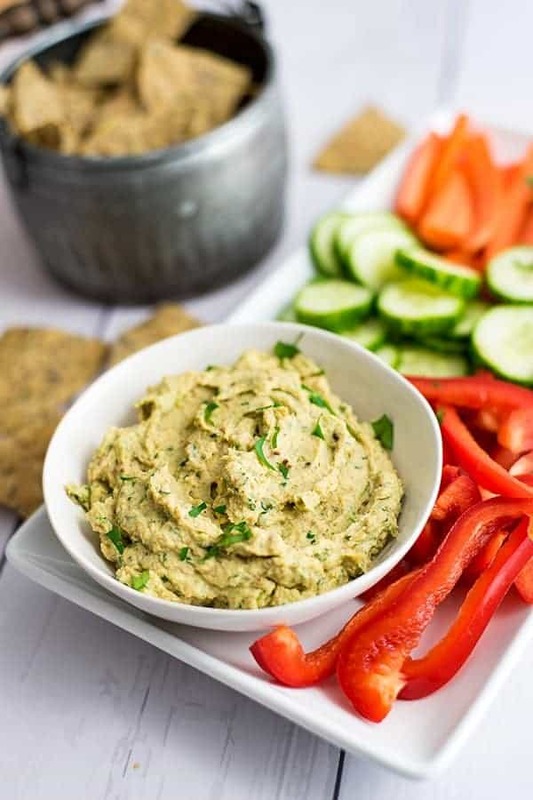 Creamy roasted cauliflower hummus is the perfect snack and a great way to get in more veggies! 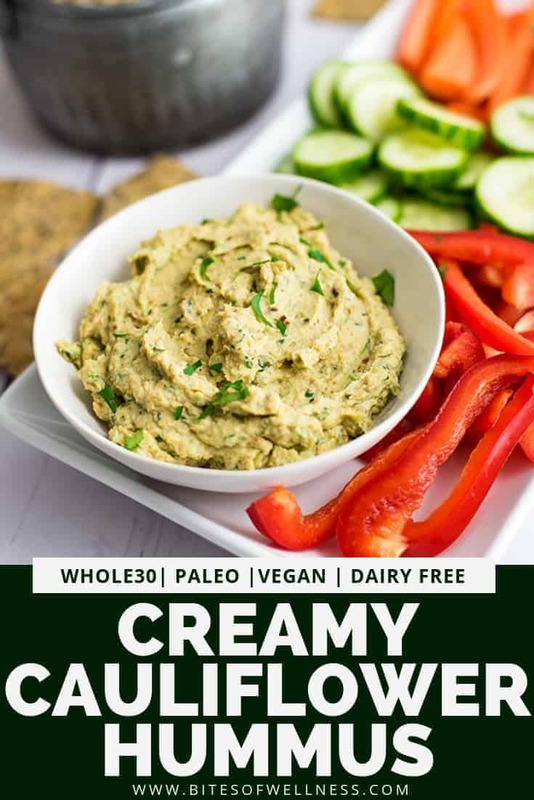 Paleo, Whole30, vegan, and grain free, this hummus is legume free and gets the creamy consistency from the combination of the cauliflower and tahini. You are going to love this for parties or afternoon snacking! 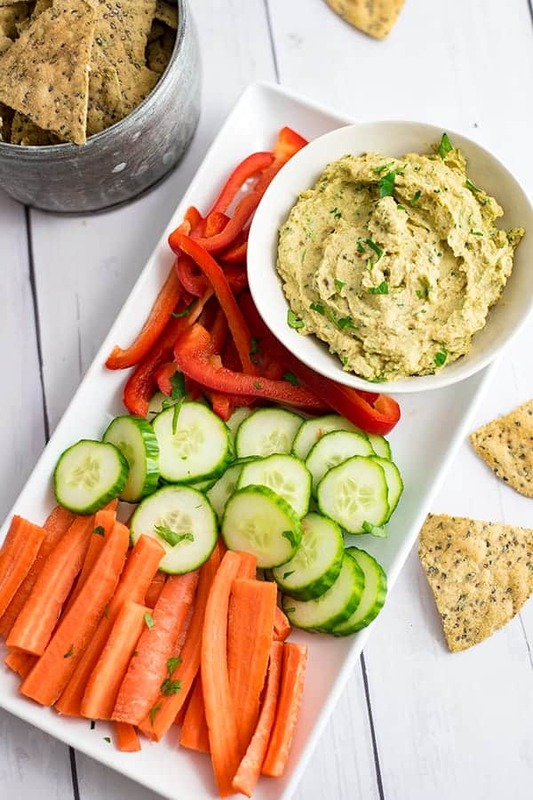 When I first started becoming more aware of my food choices, one of my favorite snacks quickly became carrots and snap peas with hummus. The creamy hummus was a welcomed treat when my 3 pm hunger cravings started! Salty, creamy and fun to dip, hummus is always a great choice. One thing I didn’t realize at the time was that the upset stomach I felt some afternoons was from going a little overboard on the hummus. 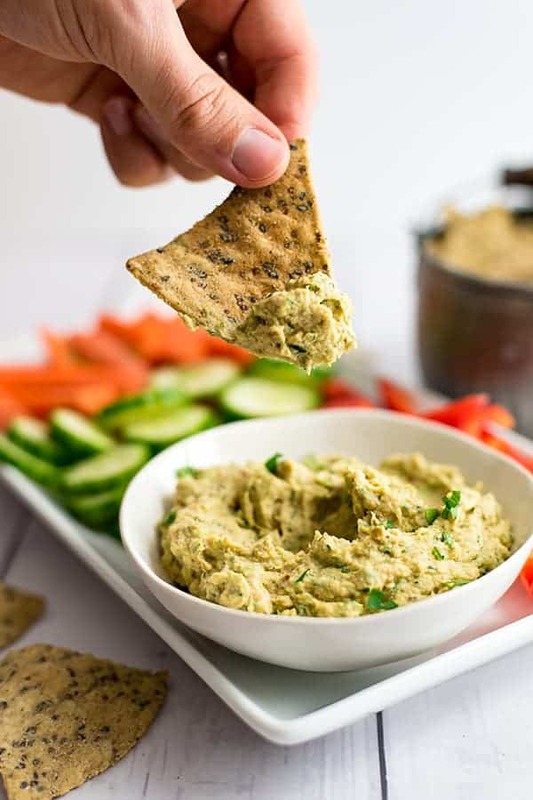 I started experimenting with paleo hummus, since I still love the idea of creamy hummus to dip my veggies in for a quick and easy snack! 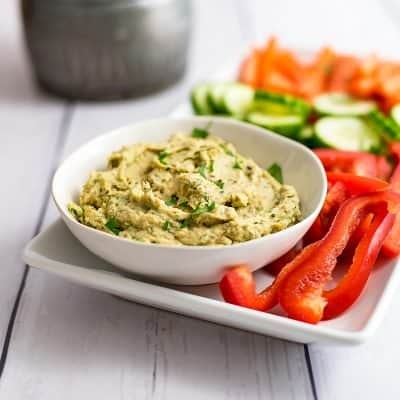 Paleo hummus is usually made from veggies instead of beans and is sometimes easier to digest than traditional hummus. How do you make creamy roasted cauliflower hummus? Start by roasting the cauliflower in the oven until slightly brown. The cauliflower starts to caramelize, which is what makes this creamy roasted cauliflower so amazing! Don’t skip this part, steamed cauliflower just isn’t the same. 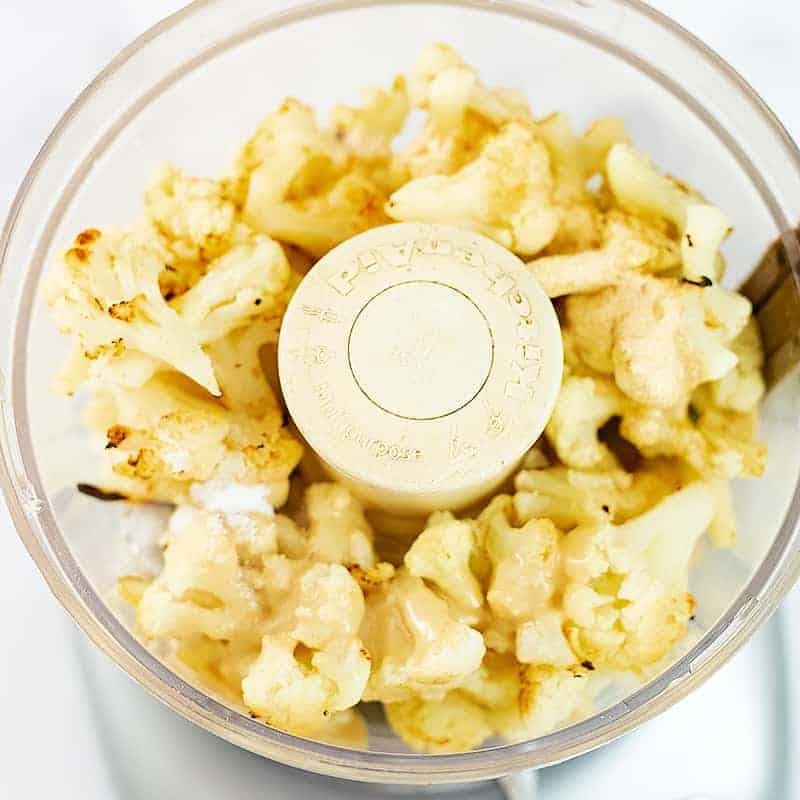 After the cauliflower is roasted, add it to a food processor with the tahini, lemon juice, salt, garlic powder and water. Process on high until there are no lumps and the hummus is thick and creamy. Store in the fridge or serve immediately with your favorite veggies or chips for dipping. 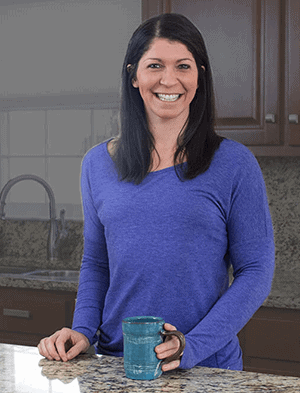 Why is this Whole30 hummus good for you? Cauliflower is high in fiber, low in fat, low in calories, and high in water. 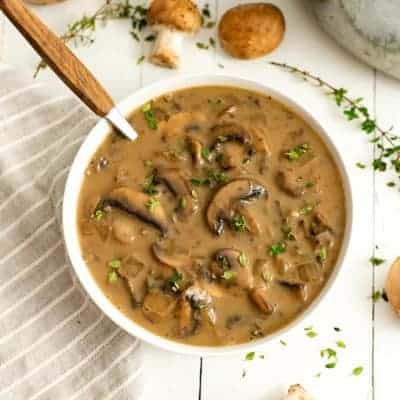 This makes it a fat loss friendly food. Cauliflower is high in Vitamin C, a great source of magnesium, potassium, vitamin K and other micronutrients. 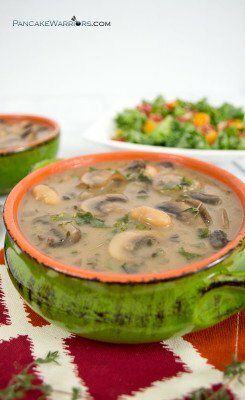 The other ingredients that make this hummus so great for your health, is tahini! Tahini is sesame seeds that are ground into a paste (like almond butter or peanut butter). Sesame seeds are a great source of calcium, Vitamin E and Vitamins B1, B2, B3, B5 and B15, magnesium, potassium and iron. What can you serve this creamy cauliflower hummus with? As part of a power bowl with roasted veggies, your favorite protein and cooked grains. This creamy roasted cauliflower hummus is the perfect snack. It's easy to make, This hummus is vegan, paleo, Whole30, and grain free! 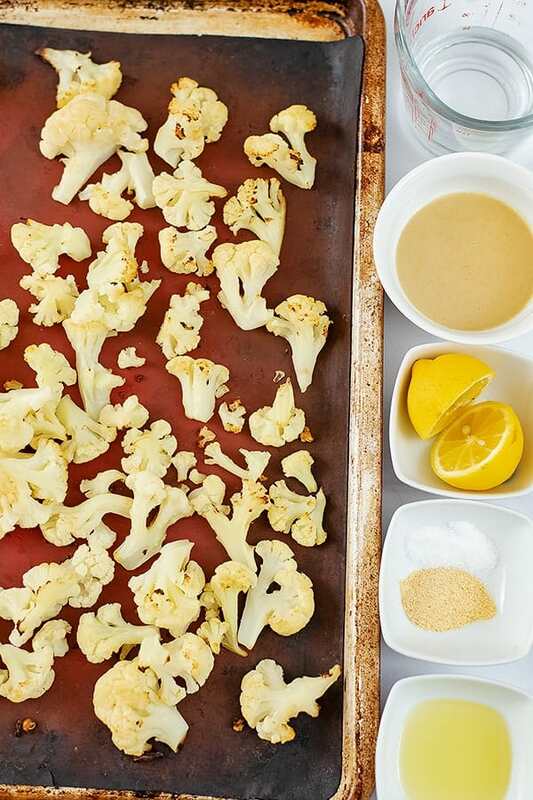 Place the frozen cauliflower on a baking sheet lined with parchment paper. Bake in the oven at 450 for 30 minutes. Once the cauliflower is roasted, add it to the food processor. Add the rest of the ingredients and blend on high until smooth.